Feline lymphoma is a cancer in cat's that causes cancerous tumors in their lymph nodes, bone marrow, liver, spleen, gastrointestinal tract, skin and eyes.It is the most common type of tumor diagnosed in cats. The disease is divided into four different classifications, which are based on the location of the tumor. The classifications are mediastinal, gastrointestinal, multicentric and miscellaneous. Mediastinal tumors affect the areas in the front of the heart, Gastrointestinal tumors affect the stomach, small intestine and large intestine, Multicentric means that the tumors are in multiple locations and can include the lymph nodes in the back of the legs, under the jaw or internal organs, meanwhile miscellaneous form of lymphoma includes the skin, nose, kidneys, central nervous system. The causes of feline lymphoma is not completely understood by the medical community. Some cats develop lymphoma without any signs of a preexisting condition that could contribute to the disease, meanwhile other cats show signs of lymphoma after contracting either feline leukemia virus or feline immunodeficiency virus, however these two viruses are not always a factor. Kittens and younger cats are much more likely to get lymphoma as a result of an FeLV infection, meanwhile senior cats tend to have lymphoma without the presence of FeLV. Depending on the location of the tumor or tumors, it can cause several medical problems such as; discharge from the nose, facial swelling, blockage of the intestines and respiratory distress. Being an observant cat owner and noticing these signs in the early stages can help to reduce the negative impact of this disease on your cat. Although Feline lymphoma is not curable, once diagnosed it can be treated, especially if the cat is taken to the vet at the first sign of symptoms. Diagnosing the disease requires the skill and aid of a veterinarian, your vet will need to perform and analyze tissue samples, blood tests, x-rays and ultrasounds. Other tests may be required depending on the suspected location of the tumors. Examination of the gastrointestinal track or biopsies of areas such as bone marrow and nose may also be required. The vet will also test for FeLV and FIV. 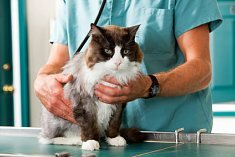 Once the veterinarian rules out inflammatory bowel disease, which presents similar symptoms to feline lymphoma, or any other health problem treatment can begin. The only course of treatment for lymphoma is chemotherapy and medications. The chemotherapy is administered through an IV, and your vet will monitor your cat's white blood cell count. Frequent vet visits and tests at the veterinarian's office will all be an important part of treating the disease. During treatment your cat will likely lose their whiskers and 5% of cats experience a bit of diarrhea and vomiting, however most cats do well during chemotherapy and experience relief from the symptoms they were having prior to treatment. Cats that have a consistent implemented treatment of chemotherapy and medication may live two years or more with the disease,however most cats die within four to six weeks without chemotherapy treatment. Since doctors currently do not have a specific cause of feline lymphoma, there are no guaranteed ways to prevent the disease, however because of the close connection to feline lymphoma and both FeLV and FIV, it is recommended that if your cat is an outdoor cat, goes into boarding, or comes in contact with other cats that do not reside in your home that your make sure that your cat is regularly vaccinated with the FeLV vaccine.